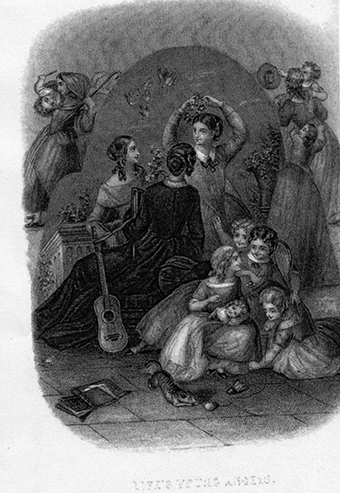 In 1839 Dr. John Bratton decided that his seven daughters needed to advance their education. Of his sons, three were away at Mt. Zion Academy in Winnsboro, South Carolina preparing for admission to South Carolina College in Columbia. At the time, the most popular female boarding school was the Moravian Salem Girls’ Boarding School in Salem, North Carolina. Many of Dr. Bratton’s nieces and his friends’ daughters attended that academy. Instead of sending his daughters away to an expensive boarding school, Dr. Bratton decided to open a female academy on his plantation in York District, South Carolina. There were no public schools at this time, so schooling was only available to children of parents who could afford to pay. As a very successful physician and cotton planter, Dr. Bratton was one of the wealthiest citizens in the upstate. With a school on their plantation, Dr. John and his wife Harriet would have closer supervision of their daughters and also gain status as a provider of female education. Dr. Bratton hired Mrs. Catharine Ladd to organize and serve as principal and teacher of his school. Catharine and her husband George Ladd resided in Macon, Georgia where Catharine taught at a female academy and George advertised as a portrait artist. Dr. Bratton may have advertised for a teacher or learned of the excellent reputation and success of Catharine Ladd through his network of planter friends. 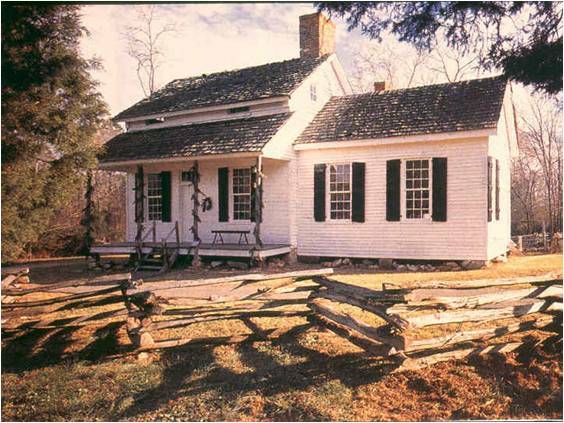 The Ladds moved to Brattonsville and lived in the former Col. Bratton home. Dr. Bratton transformed his father’s one-and-a-half story log home into the school, by extensive remodeling and the addition of a south wing for the classroom. Col. William Bratton home/Brattonsville Female Seminary c. 1839. Photograph by CHM. The household included George, age 37; Catharine, age 31; Catharine’s widowed mother Mrs. Ann Stratton, age 56; two sons Wash and Charlie, age three and one; and two enslaved females, one between 24 and 35 years and the other under ten years. Classes began at the private academy in January 1840 with an enrollment that grew to around twenty girls in two years. Some girls boarded with the Brattons and others with the Moore family who lived nearby; a few girls were day students. It is known what the girls studied because Catharine Ladd advertised Brattonsville Female Seminary (the term for an academy with an advanced curriculum) in The Compiler (Yorkville, SC): a four-year course intended primarily for girls from age twelve to sixteen. No corporeal punishment will be allowed; and pupils over the age of twelve, who cannot be managed by the force of reason, will be expelled. No superfluous expense will be allowed in dress; and pupils will be required to be neat but plain. No pupil will be admitted for a less time than a half term of five months. Academic subjects were part of the English Department, while music, art, and needlework were electives in the Ornamental Department. Full-color examples of Mrs. Ladd’s student work are at this link. The four-year course was equivalent to a high school education today. Girls younger than twelve, and there were four Bratton girls from five to ten years old, could take a preparatory course in the English Department. An average cost for two sessions of five months each was around one hundred dollars depending on electives. A few girls attended under the Free School Act of South Carolina. Their tuition fee was subsidized by a Board of York District Free School Commissioners. Student oral examinations in the fall were open to the public and announced in the paper, followed by a Christmas break of a month for boarding students to go home. There was also a spring break between the five month sessions in May or June. Mrs. Ladd supervised and taught the academic subjects and painting and drawing, Her portrait artist husband likely taught the painting of miniatures. It was usual for a student older than sixteen to assist the teacher. In this case the assistant was Mary Ann Poulton or a cousin Margaret Bratton. (These names were known through the letters of daughter Martha Bratton written to her brother John.) Catharine’s mother may have assisted in the needlework instruction. Dr. Bratton hired a music teacher to teach pianoforte and guitar. The female enslaved woman and child labored in the daily domestic chores of fire tending, cooking, cleaning, washing and ironing, gardening, hauling water from the spring, caring for children, assisting students with personal care, and anything else that needed to be done. They “lived in a little cabin in the yard” [phrase taken from the title of a book on slave narratives of Virginia by Belinda Hurmence] on the north side of the house/academy building. 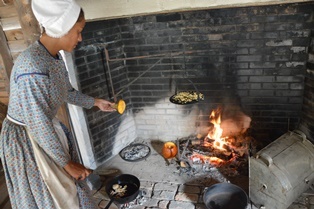 African American female reenactor at the cooking fire, Brattonsville kitchen dependency. Photograph by CHM. Dr. Bratton’s daughter Martha Elizabeth was fifteen when Brattonsville Female Seminary began classes in January 1840. Mrs. Ladd took a special interest in Martha’s talents in painting and writing. Besides the landscape painting of Brattonsville, she also painted a still life of fruit called a theorem. 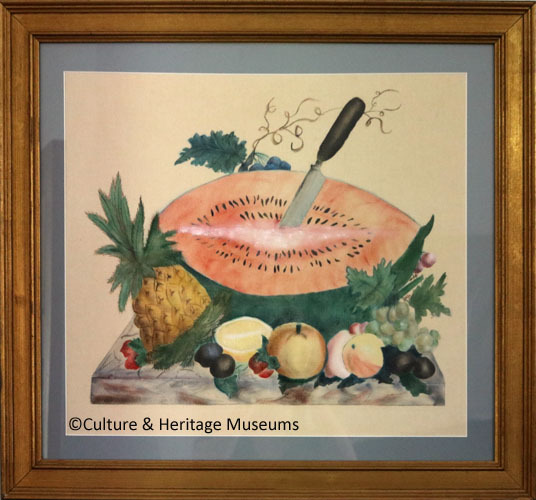 Theorem painting of watermelon and fruit, reproduction, painted on velvet by Marian Mannheim. Collection of CHM. Original on silk by student Martha Bratton c. 1840. 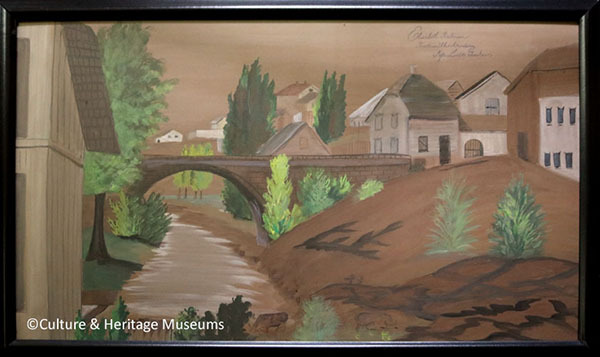 CHM owns this reproduction painted on velvet by Marian Mannheim. Original still owned by family descendant. Image of original is in poor condition. Elizabeth Robinson was a day student from Chester when she painted an Italianate landscape in tempera paint on paper. Elizabeth Robinson was a day student when she painted this Italianate landscape in tempera paint on paper, c. 1840. Inscription: Elizabeth Robinson, Brattonsville Academy, Mrs. Ladd, Teacher. Collection of CHM. Photograph by CHM. There is one surviving example of needlework from Brattonsville Female Seminary. Elizabeth Bratton stitched a Bible verse with colorful worsted (wool) in cross stitches on perforated paper. Elizabeth Bratton stitched this Bible verse, “Thy Will Be Done”, in cross stitch with worsted, Zephyr (wool) on perforated paper, c. 1850, Brattonsville Female Seminary. Collection of CHM. Photograph by CHM. Martha Bratton wrote letters to her brother John who was away at boarding school and then at South Carolina College. In the letters she revealed details of her life as a student at home and the gossip. In this letter Martha used the term scholars for students, and she sent her brother some money as he requested. You might notice her punctuation and capitalization were neglected as she hurriedly wrote out all her thoughts. Edward and Rufus are her other brothers away at school. 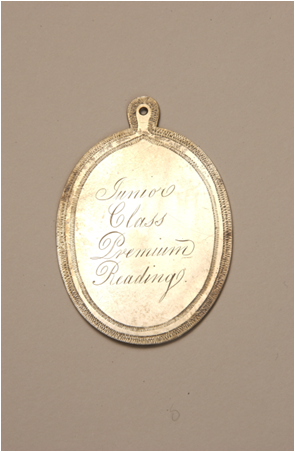 Silver medal awarded to student Priscilla Boyd, Junior Class, Premium Reading, while she was a student at Mrs. Ladd’s Winnsboro Female Institute, 1851. Collection of Fairfield County Museum, no. 200. Photograph by FCM (Fairfield County Museum). Lines on the Death of M.R. Although the identity of “M. R.” was not revealed, the subject of a young person’s death was something that children and adults alike kept close in their thoughts. A child who lived beyond her youthful years was considered very fortunate, as death was a constant reality . After the date of this poem Martha experienced the death of her father Dr. John Bratton, and best friend and cousin Martha Steele in the same year. The death of another student, Elizabeth Robinson of Chester, soon followed. Mrs. Ladd taught at Brattonsville for two years until her good reputation and success caught the attention of the Woodward family and the Feaster family in Fairfield District, South Carolina. In fact several Woodward sisters attended Brattonsville Female Seminary. The academy at Brattonsville continued to grow under the direction of other teachers. The Woodwards made Mrs. Ladd a good offer to teach in Winnsboro, but she left there in 1844 to teach for four years at Feasterville Female Seminary. 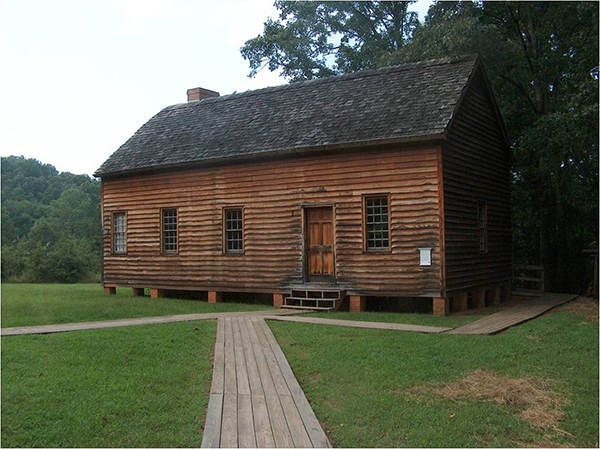 John Feaster built a school and boarding house just for Catharine. In 1849 George Ladd purchased several town lots in Winnsboro where Catharine opened Winnsboro Female Seminary. By 1852 George was able to buy the three-story, brick Ketchin house on Main Street for the academy. Catharine kept that academy business going until the onset of the Civil War, when circumstances forced George to sell the three-story brick building. The Ladds made Winnsboro their permanent home. Today third and fourth graders can experience what school was like in 1840 by attending a program called Historic Brattonsville Academy: Schooldays of 1840. A reproduction academy was constructed in 1996 at Brattonsville by the Applied Technology students from Rock Hill School District. Brattonsville Academy 1840, Historic Brattonsville. This building was built in 1996 by students in the Applied Technology program of Rock Hill School District. It is a reproduction of the Feasterville Female Seminary. Students attend an immersion program here to learn what it was like to go to school in 1840. Photograph by CHM. 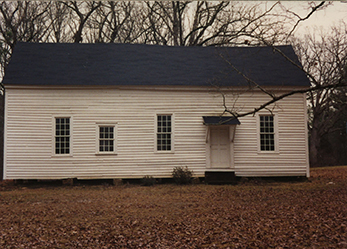 The building is a copy of the academy where Mrs. Ladd was principal from 1844 to 1848 in Feasterville, Fairfield County, South Carolina. Students follow the curriculum of Mrs. Ladd’s school of 1840, except instead of only girls, boys and girls attend together.